This is an advertorial for You/Us Hotel in Jungmun. You/Us Hotel is situated in the center of Jungmun, within walking distance to the ICC. 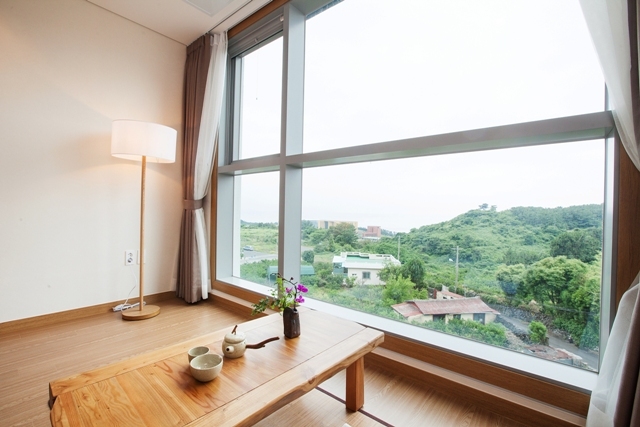 It is clean, affordable and has some spectacular views of Jeju’s southern coast as well as an outdoor terrace where you can enjoy a morning coffee. The hotel was built last July. If you are attending a conference it takes around 10 minutes to get to the International Conference Center on foot or three minutes if you take the hotel shuttle bus. 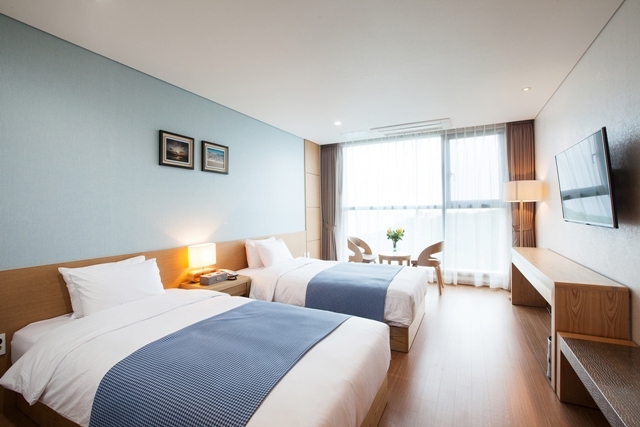 If you have time during your conference to take in some of the sights of Jeju, You/Us Hotel is perfectly situated in Jungmun, one of the most popular tourist locations in Jeju. In fact, there are plenty of places to see within walking distance of the hotel. First off, is Cheonjeyeon Waterfall. Cheonjeyeon is a three tier waterfall. It is 22 meters high and, depending on rainfall, up to 12 meters wide. 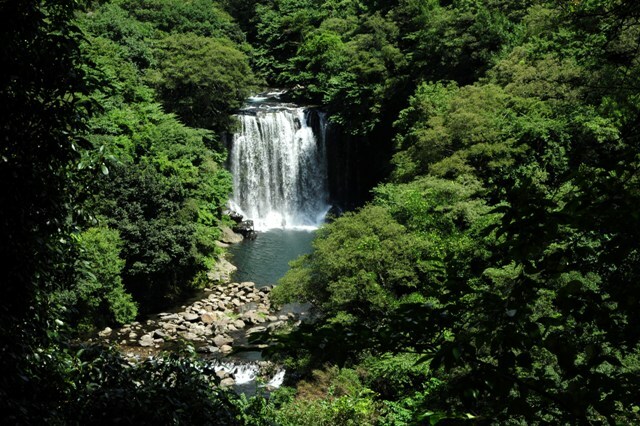 The area surrounding the waterfall is well known for its biodiversity and it is home to more than 450 plants including two that are indigenous to Jeju. A little further away is Daepo Jusangjeolli Cliff. The cliff, with its unique, almost perfectly formed hexagonal columns, towers 20 meters out of the ocean and runs for 2 km along the coast, making for a beautiful yet short coastal walk. If you fancy a longer stroll, Olle Trail No. 7 starts near to Jungmun and is easily accessible from the hotel. This trail is 13.8 km long and takes in some of Jeju’s finest coastal views. A recent problem that has affected many of the hotels around Jeju is that of the decreasing number of Chinese tourists due to the deployment of THAAD in Korea. However, Kim Dong-ho, general manager of You/Us Hotel, said that they have been relatively unaffected. Aware that many of the visitors to these conferences don’t get the chance to experience much of Jeju, Kim decided to open a restaurant selling a very Jeju specific type of food. Their new restaurant “Samsam” is a black pork barbecue restaurant that sells the highest standard of pork. The restaurant has another unique selling point, the fact that they sell wine to go alongside their barbecue! “I booked my room at You/Us Hotel without knowing much about it. I love how clean and modern the hotel is as well as its service and kindness. Earlier in the trip, I had booked a hotel near to the airport. Compared to that “hotel”, You/Us Hotel is like a five-star resort. The hotel is clean and the staff were friendly and kind. Since it is in the center of Jungmun, there are many tourists attractions and restaurants within walking distance of the hotel. “When we built the hotel we wanted to make it as eco-friendly as possible. Because of this, we used many eco-friendly materials in the design of the hotel. “We train all our staff to be able to provide as comfortable an experience as possible to the hotel’s guests. We want our guests to remember their stay in our hotel fondly so they can recommend it to their friends.